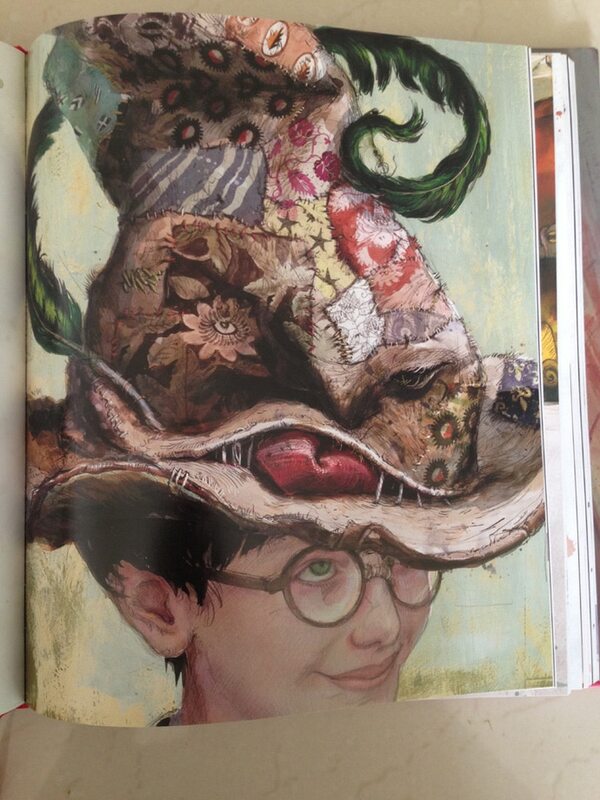 Jim Kay's attention to detail is a fitting tribute to JK Rowling's fabulous story. Over the last few months, Potterheads have been getting email owls from Bloomsbury announcing the launch of an illustrated Harry Potter book series. It was reported that Jim Kay, who won the Kate Greenway Medal for his gothic illustrations of Patrick Ness' A Monster Calls, has been commissioned to illustrate one of the most popular books of our times. In an interview to The Guardian, Kay said that he reacted to the news with an "explosion of delight, followed instantly by an implosion of brain-freezing terror". An understandable reaction. After all, every Potterhead in the Muggle universe has a distinct visceral idea of how the staircases in Hogwarts move, what the chaos on Platform 93/4 looks like on the day the Hogwarts Express leaves for the Best School Ever, and how the castle changes as autumn slips into winter. The world of Harry Potter which was created by JK Rowling some 18 years ago continues to exist in the collective imagination of Muggles across the world. Given that I own all the Potter books and the spin-offs, a handsome army of figurines, and bits and bobs such as the Elder Wand and the Gryffindor pen, I had told myself sternly that I did not need to buy this book. My imagination was good enough. Further, like all Potterheads, I had already had to contend with the film versions and my opinionated thoughts about the adaptation. But merely hours after the book launched on October 6, I succumbed to temptation. A shiny copy of Harry Potter and the Philosopher's Stone has been added to my considerable collection. And I don't need Veritaserum to admit that I have no regrets. The new book is a coffee table tome (costs like one too), resplendent with colours and quirky characters. A word of warning: If you are planning to tote it around to show it off to your Muggle friends, think again. 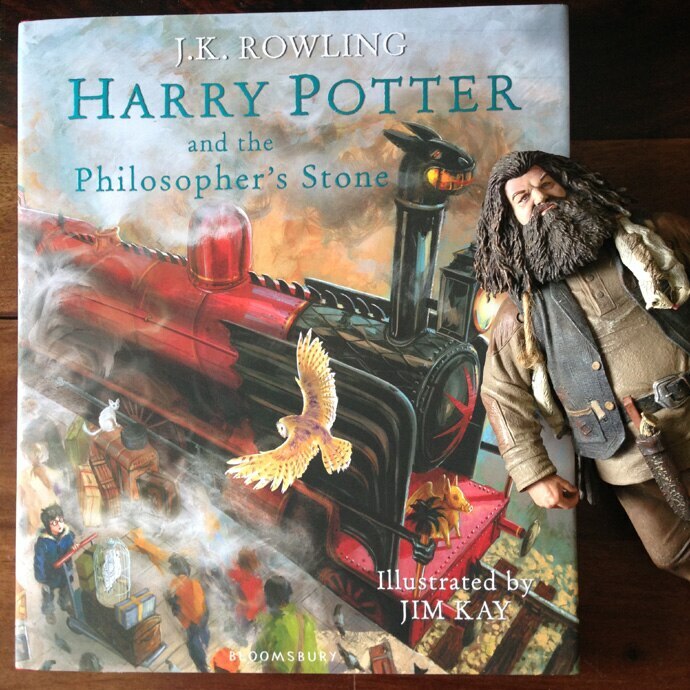 The book is Hagrid-size. As I opened the book reverently, it took me back to my childhood, to the eighties, when we read beautifully illustrated books from Russia, UK, and Europe. Those books were interspersed with dreamy water colour illustrations sandwiched between the stories. Kay's book is reminiscent of those classic stories, but with his personal, quirky twists. The good news is that The Boy Who Lived has green eyes, while Dumbledore has piercing blue eyes. On that happy note, let us reread the beloved tale. Each chapter starts with a detailed illustration which gives the reader an inkling of what's about to come. In a YouTube video, Kay explains how he even made 3D models to understand how the light would fall before illustrating the final version. And Merlin's Beard! The details are what make the book a treat. For instance, he puts the hog in Hogwarts with boar gargoyles on the intricate castle of his imagination. Backgrounds are richly textured, as is the landscape. The illustrations get richer as Harry steps into the wizarding world. Diagon Alley will make you gasp with delight. This is Harry's (almost) first glimpse of the wizarding world, and true to Rowling's prose, the illustration shows a cobbled street that twists and turns with shops piled high with strange wares. Draco Malfoy makes an appearance - pale, pointed face (check) with cold eyes. On his website Kay says that he achieved the slightly unsettling effect using a simple trick - "If you illustrate a person's eyes perfectly symmetrical, there's something creepy about their appearance". The Sorting Hat is a wonderful surprise. Rowling described it as patched and frayed, and Kay's Hat is all of that. But it's also bright and happy with textured, colourful patches - poles apart from the comparatively surly movie version. On his website, Kay describes the making of the Sorting Hat, "One of the fabrics is from a beautiful book of fabric samples I saw years ago in the Royal Museum, Edinburgh. Never know when you'll find a use for the little notes you make." It's evident the Kay has drawn Hagrid with much affection. The bearded half-giant sports a skull and bones scarf and has little badges on his coat, an idea that Kay borrowed from his school caretaker. A lot of Kay's inspiration comes from the world around him - whether it's strangers he bumps into or people he knows well. Like Rowling, Kay seems to love metaphors and symbols. Dumbledore sits at his desk, choosing a Sherbet Lemon while a praying mantis sits close by. In an interview to Pottermore, Kay said that the mantis, which means prophet, depicts the headmaster's honesty. Most of the characters only appear once or twice in the book, which is a bit of a disappointment. Like Oliver Twist, you can't help but want more. But don't get your wands into a knot - when you have majestic Norwegian Ridgeback dragons flying across the page and Mountain Trolls thumbing their snouts at you, there's really not much room for complaint. Wait until you get to Quirrell/Voldemort, the tantalising peek will ensure impatience for the second book to come out soon. 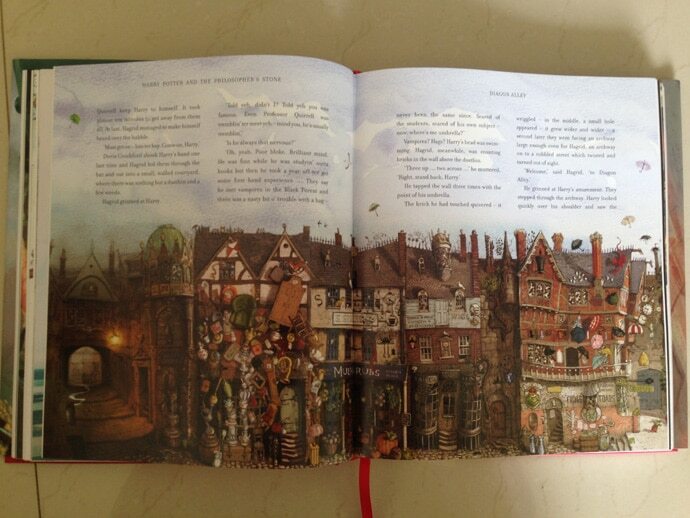 At the back of the book, Rowling says that she was moved profoundly by Kay's illustrations. The attention to detail, the masterful paintings, and the thoughtful deliberation on the characters, all of it is a fitting tribute to her fabulous story. The illustrated version is something that Madam Pince will guard fervently in her library, and as will us Potterheads.